Welcome to the August 2013 THHN Newsletter. What a wonderful month July was and how lovely to be able to provide our holidaying families with some spectacular sunshine to enjoy as well as all the other great activities that they can get up to while they’re here. Why go anywhere else? 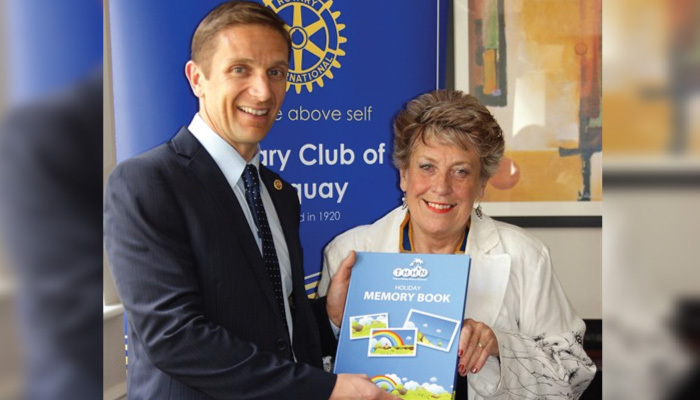 Thanks to the Rotary Club of Torquay, when families come on a THHN holiday from now on they’ll be given a Memory Book. This great new idea is essentially a scrapbook so that families can record what they get up to whilst on their holiday. The Rotary Club of Torquay has generously donated 500 books and they have received a great reception from the families that we’ve given them to so far. These books give our guests an opportunity for everyone to make notes about what they did, keep leaflets, put photos in or just doodle away however they choose. We’re absolutely delighted with them and can’t thank Viv Daubenspeck and the Rotary Club of Torquay enough. We had to change the date of the Toorak Summer Ball but that’s OK as it gives us another chance to tell you all about it. With great food and entertainment from Chris Chaplain and Steve Laister along with music from gypsy swing band, Hammer & Isaacs it’s set to be a fantastic night. Tickets are just £30 each to include a sumptuous 3-course meal and are available from the Toorak Hotel Reception or phone 01803 400400. It’s all in aid of raising money for our vitally important bungalow project. The very nice people at Haddon Galleries are hosting an Art Day with an art auction and raffle of artwork in the evening. We’ll bring you more details soon but please put the date in your diary. Students of Brunel House at Westlands School in Torquay who have made the THHN their chosen charity for the year. They’ve already made a great start raising £21 at a break-time cake sale. We’re really grateful for their support. Hotel De La Mer who this month welcomed four families, one from the Rainbow Trust Children’s Charity, one from Parent’s Association for Seriously Ill Children (PASIC) one from Bristol CLIC Sargent and another from Scottish charity CCLASP (Children with Cancer and Leukaemia Advice and Support for Parents). Brunel Manor who accommodated a family from Rainbow’s Children’s Hospice. Claire’s Cakes, D&H Fishmongers, Save on Meats, Hallets the Bakers, Steers the Greengrocers, Luscombes Butchers of Totnes, Riverford Organic Home Delivery, all of whom provide delicious things for our families to enjoy whilst on a self-catering holiday. All the pupils at Priory Roman Catholic Primary School who took part in June’s Pennywell Holiday Hike. They raised an amazing £230 and had a great time too. David Musgrove and the Disabled Sailing Association who organised a very special day out for a wonderful little boy and his family – all at pretty short notice too. They could not have been nicer. Winners 2000 for the constant support they give us and especially on a Friday when all the team were a THHN t-shirt or vest and help us spread the word. You are wonderful ambassadors for us and a joy to work with. Harry and the team at The Royal Exeter Hotel in Bournemouth who welcomed a family referred by Scottish charity CCLASP (Children with Cancer and Leukaemia Advice and Support for Parents). This amazing feedback just goes to demonstrate how much of an impact our holidays can have – well done everyone! August marks the 4th anniversary of the THHN. In that time we’ve given holidays to over 340 wonderful families. There are so many people involved in each of those holidays – as a network we should be very proud of ourselves. Thank you to each and every one of you who has helped in any way, large or small. Long may our work continue.